I was craving wings last weekend. LIke, really craving wings. Unfortunately, there aren’t really any good places in Kalamazoo. As a backup, we tried to go to Buffalo Wild Wings but there was already a line out the door at 4:30 on Saturday night. We ended up walking next door to Bilbo’s instead where I was able to get some delicious smoked wings, but I was still really, really craving wings the next day. The next day, I was at work and not really doing anything, so I started looking for a wing place open in Grand Rapids on a Sunday. 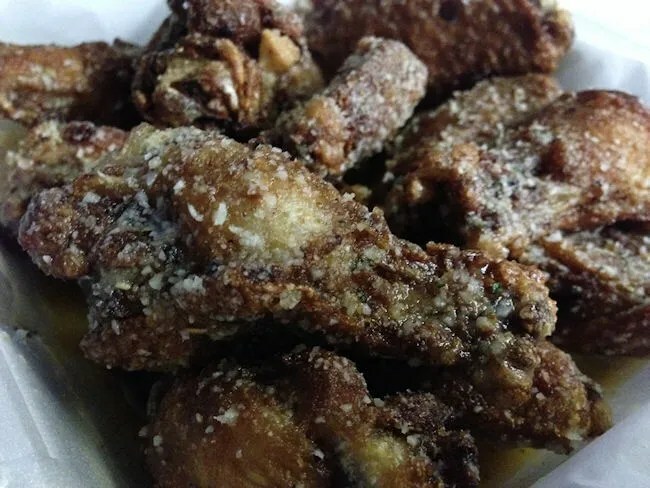 There are a couple really good wing chains in the area, so I had some choices. The place I settled on was the Wing Kingz on South Division Avenue just south of 36th Street in Wyoming. The small shop is a carry-out place only. I’m not even sure they have an “inside.” It looks like all they really have is a drive-through window on the side of the building. 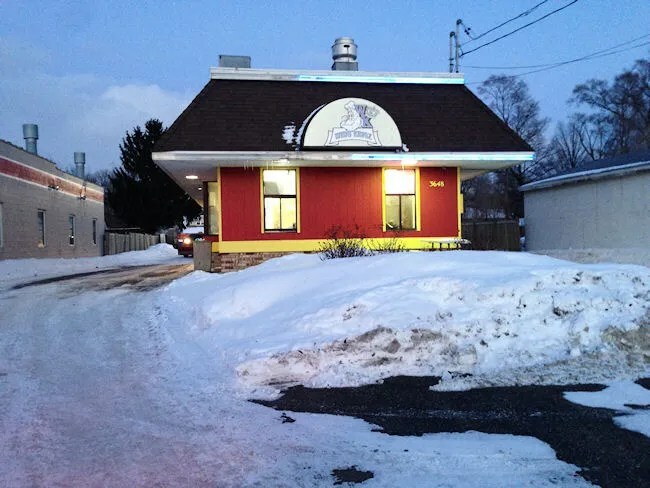 Before the building was a Wing Kingz, it was a Wing Heaven. 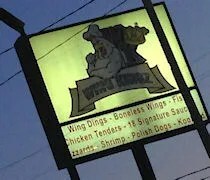 As I mention every time I write an entry on either Wing Kingz or Wing Heaven, I really want to know what’s going on with these two chains. They’re practically the same. Practically the same menu and every thing. Oh, and a lot of the Wing Kingz locations are old Wing Heaven locations and Wing Heaven locations are popping up in new places. Before I left the office, I called to make sure they were open and to put in my order. As per usual, I ordered twelve traditional wings with the Garlic Parmesan salt and a pound of french fries with salt and pepper. The bill was a little over ten bucks and I was told it would take about 15-20 minutes to cookt he chicken up. When I got to Wing Kingz, I drove around the building and past the order speaker since I had already placed my order. I pulled up behind two other cars, I was killing time so I didn’t get to the restaurant too early. I should have just went and got in line. It took at least ten minutes but probably more like fifteen. It took a long time to get up to the order and even once I got there, it seemed like it took longer than it should have to get my food. I had assumed it would be waiting since I was pretty close to a half hour at that point. I was really hungry as I was pulling out of the parking lot and back on to Division to head back to work. Obviously, I couldn’t eat the wings, but I could eat the fries. I pulled the Styrofoam container of fries out of the bag and jumped right in. 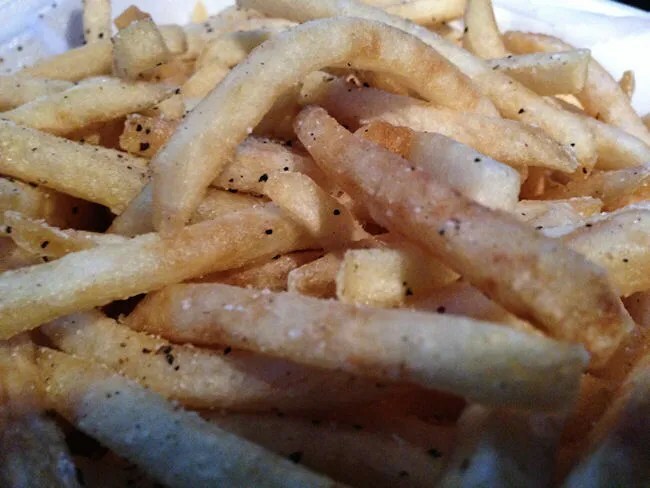 It’s pretty amazing what happens when you add pepper to fries. The fries themselves are pretty generic restaurant fries, but they were very crispy and had a generous coating of salt and pepper. Salt and pepper make everything better and these fries were stunningly good for what are essentially fast food fries. The fries were gone by the time I got back to work, so I tossed that container in the dumpster and headed inside to devour the wings. I’ve eaten a couple different Wing Kingz location and I am never disappointed. These wings satisfied the craving I had been having. They’re big. They’re juicy. They’re crispy. The only downside is that I felt like I was burping garlic for two days…but they are so good going down the first time. I didn’t really like the drive-thru only part of this location, but as I started biting in to the tender, cheesy wings, I forgot about all that.